Throughout your visit to the ER, please ask any staff member if you have questions. Triage (which can occur at the bedside) – A nurse specializing in pediatrics will initially assess the seriousness of your child’s symptoms. This process allows us to determine the immediacy and type of medical attention your child needs. Check your child’s temperature, heart rate, oxygen level, breathing and blood pressure (if needed). Registration –This process provides us with the ability to develop a medical chart and to order lab tests and x-rays, if necessary. Legal guardianship is validated, so that you may give consent for treatment. Family Waiting Room – We ask family members to wait in this area until the medical team can see your child. You and your child will be taken to private exam room as a room becomes available. Please tell the triage nurse if your child seems to be getting sicker or if he or she needs to use the bathroom. 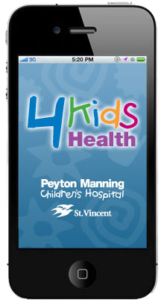 Admission –The Emergency Department physician may recommend that your child be admitted to Peyton Manning Children’s Hospital for additional evaluation and treatment. We will attempt to contact your child’s primary care physician. Your child’s hospital room will be prepared. You will be escorted to your child’s room. In most cases you will be able to stay with your child. Please ask a staff member if you have questions.